March is a month of anticipation. I spend a bit of time every day searching for signs that spring is arriving. In the Finger Lakes during March, the most obvious spring signals are from imported bulbs - species crocus, Scilla spp., hardy daffodils. But late February to March is when the sap is rising in woody plants, and to see the native harbingers of spring one should just look above the ground. By late March, or early April, one clear spring signal is the flowers of hazelnut, Corylus species. 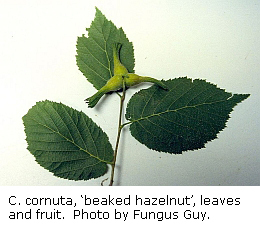 Corylus americana, American hazelnut, and C. cornuta, beaked hazelnut, are both native to the Finger Lakes. 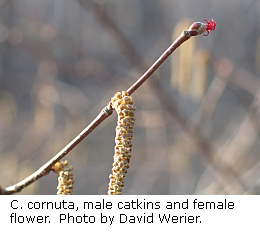 The prominent catkins are the male inflorescences; the female flowers are very inconspicuous until they open and reveal their scarlet styles. The female flowers become edible nuts by fall. If you can beat the squirrels to them, the nuts are said to be of similar quality to commercial filberts, just smaller. Their leaves, serrated and strongly veined, have lovely brown to yellow fall colors. In the Finger Lakes region, the European hazelnut, Corylus avellana, is recorded from Livingston county, and may have escaped elsewhere in this region, plus various Corylus cultivars are used in landscaping. But if you see a hazelnut in the woods or at the edge of a swamp, it is likely to be one of our natives. 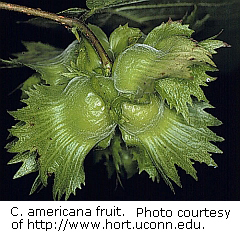 American hazelnut fruit is easily distinguished from the beaked hazelnut. The bracts extend around the nut in both species, completely covering the nut in the beaked. Bracts extend roughly twice the length of the nut for C. americana, and are even longer in C. cornuta, extending into a tubular beak. Corylus americana is shrubby (3-5m), with smooth grey bark, and has more pubescent (to bristly) twigs than C. cornuta. Corylus cornuta is about the same size (4-6m), has smooth brownish bark, and has glabrous to sparsely pubescent twigs. 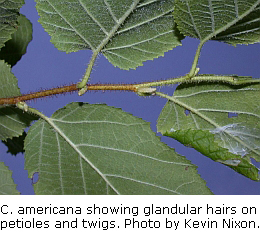 Vegetative individuals of C. cornuta can be distinguished from C. americana by the absence of glandular hairs on the petioles and young twigs. (Flora NA). For additional descriptions and comparisons, see the links below. The Tompkins County Flora (TCF 2008) at Cornell’s Bailey Hortorium has Corylus americana specimens from 1875 in Six Mile Creek and other locations in Tompkins county through the early 1900s. (Most were collected in early April or late March, possibly reflecting their most visible period.) In the Cayuga Lake basin, C. americana is currently listed as scarce (Wesley 2008). Present throughout the Finger Lakes and coastal counties of New York, C. americana is considered common statewide (NYFA). In fact, in some parts of its North American range (Eastern Canada & U.S. south through GA & LA), C. americana is apparently considered rather weedy. It is an upland species, growing in thickets, open woods, and disturbed areas. The earliest specimen of Corylus cornuta in the Tompkins County Flora was collected by Wiegand himself in 1892 from Cascadilla ravine (TCF 2008). Corylus cornuta is still common in the Cayuga watershed (Wesley 2008) and is found throughout the state (NYFA). It is an understory shrub in deciduous and mixed deciduous coniferous forests in west-central to eastern North America (Flora NA). Beaked hazelnut also occurs on forest edges, cut forests, and in thickets, generally in thin poor soils (NYFA). Twigs, bark, and nuts of both species have been used medicinally (Ethno). NYFA: 2009 New York Flora Atlas; Weldy, Troy and David Werier. [S. M. Landry and K. N. Campbell (original application development), Florida Center for Community Design and Research. University of South Florida]. New York Flora Association, Albany, New York.